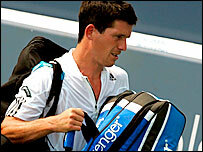 Tim Henman's miserable year continued in the Cincinnati Masters as he lost in the first round to Juan Ignacio Chela. Henman, currently ranked 92, was beaten 6-4 3-6 6-3 by the Argentine. Chela took the first set after breaking Henman's serve in the seventh game, but the Briton fought back to level, before allowing the match to slip away. "I'm coming on to hard courts and struggling with my back again. That's been an issue for quite some time," said Henman reflecting on his loss. "You feel like you're playing in pain most of the time. "Playing on the hard courts, it's always going to be pretty tough on the body. And, you know, I've done it for a few years." This was the second straight first-round loss for Henman, who was defeated by American John Isner in the opening round at Washington two weeks ago. The 32-year-old has won only three tour matches all year and has seen his world ranking slip to 92 - his lowest since 1996. But he has put off any decision about his long-term future until after Britain's Davis Cup tie against Croatia in September. "I appreciate that I'm nearer the end of my career than the start," said the Briton, who will play in New Haven before travelling to New York for the US Open. "But I've got this - the tournaments coming up, the US Open and Davis Cup. So I'll sort of take it in those sort of segments and see how I feel." Just two weeks ahead of the US Open, Henman's inconsistency proved his undoing on Monday in front of a sparse crowd at Cincinnati's Lindner Tennis Centre. Henman looked impressive in the second set, winning three of the last four games to love, producing some stunning winners. But the British number two proved unable to keep up that momentum in a match that lasted just under two hours. Henman had a break point on the Chela serve in the first game of the third set but the Argentine held. Chela proved more ruthless when he had a break point in the eighth game to go 5-3 ahead. And Henman was unable to threaten the Argentine's serve allowing Chela to progress to the second round, where he could meet Andy Murray who faces Marcos Baghdatis on Tuesday. In Monday's other matches, Marat Safin was dumped out of the tournament by German Nicolas Kiefer, who beat the Russian 6-3 7-6 (7-1). At one stage in the opening set Safin was losing 5-0. Safin said: "I'm not going to kill myself and feel bad for the next month and a half. It happened, but it's not the match that I will remember for the rest of my life, so who cares. "Play terribly and that's it. Life moves on." Safin's compatriot, Mikhail Youzhny, the 13th seed, had better fortune, cruising to a 6-3 6-1 victory over Dominik Hrbaty of Slovakia. Carlos Moya beat David Nalbandian 7-6 (7-4) 7-6 (7-2), and Jurgen Melzer of Austria survived five double faults and saved four break points for a 7-6 (7-4) 7-6 (7-2) victory over Ivo Karlovic of Croatia. Top-seeded Roger Federer, Rafael Nadal and Andy Roddick - who won the tournament last year - were among those with first-round byes.